As much as there is great Dim Sum to be found in the GVRD, it is amazing how few options we have in suburbs such as Surrey, Burnaby, New West and the Tri-Cities. It seem like the bulk of the places reside in Richmond and Vancouver. Not very convenient, let alone environmentally conscious with people driving great distances for Dim Sum. In the case of Richmond, I think there is a real risk of vehicular maiming too. In the case of Burnaby, we have one "upscale" Dim Sum joint in Fortune House at Metropolis. It's okay if you like waiting in line for over an hour, only to be seated in a can of sardines doubling as a dining room. Yes, Top Gun also serves up "better" Dim Sum at Crystal Mall; however, the lineup is just as large and let's not even get started on the circular parking lot from hell. Alternatively, there some smaller places such as Wah Lun and Yan's Garden. Reluctantly, I will also mention Po King, which is the equivalent of Chinese water torture. Yah, the food is respectable there. You just have to put up with being treated like an inmate at the Dim Sum Correctional Institute. 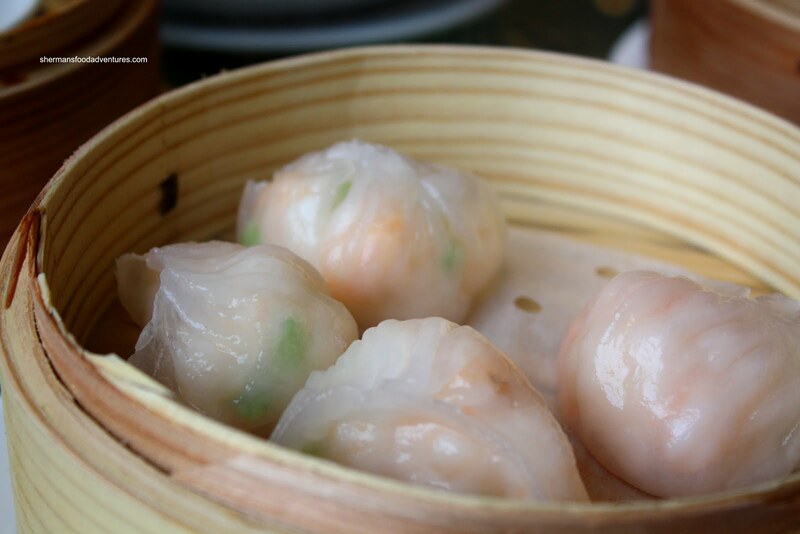 There is definitely plenty of room for another Dim Sum restaurant in Burnaby. 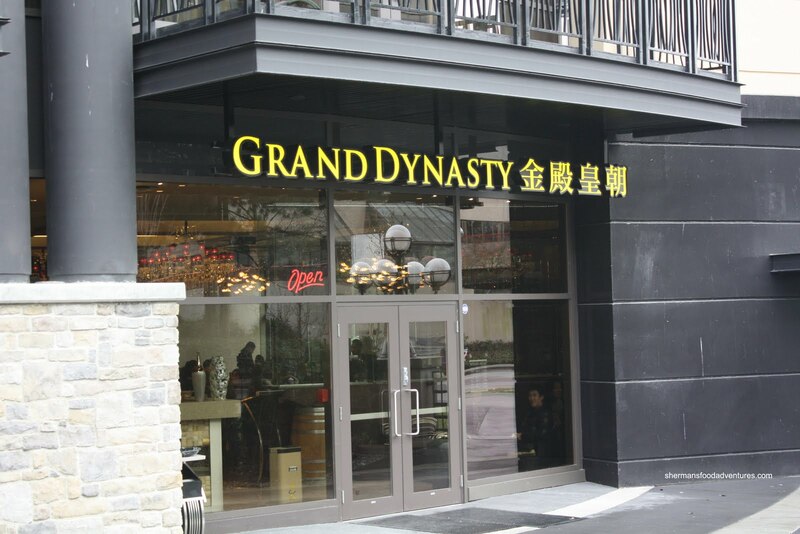 Taking a page for the "build it and they will come" playbook, Grand Dynasty enters the scene. Situated within the Grand Villa Casino at the Delta Hotel, Grand Dynasty is definitely upscale. From the beautiful decor and attentive service to the "Downtown" prices, this place is unlike anything we've had in Burnaby up until now. Similar in concept to the Kirin attached to the Starlight Casino in New West, Grand Dynasty offers upscale Chinese food for the gambling clientele and beyond. The actual restaurant is not really that big. I can safely assume a banquet would involve catering into one of the large ballrooms. Honestly, I didn't even know that the place had opened up (only 5 days ago). My mom had tipped me off since she heard the ads on Chinese radio. Always anxious to try out new places, we headed there the next morning for Sunday Dim Sum with the family. The restaurant itself is at the East end of the hotel where the adjacent parking lot is rather small and not user-friendly. Case-in-point, I ended up following a clueless driver into the full lot where all he ended up doing was stopping at the entrance and blocking traffic in and out of the place. And to think I thought Crystal Mall is frustrat ing. Not to worry though, there is plenty of parking across the street at the free spacious Casino lot. As mentioned, the restaurant itself is not very big; however, it is spaced out decently so it doesn't feel too cramped. As we were part way through our meal, a large lineup started to build. 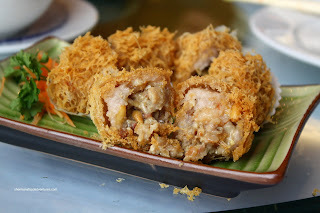 We started with the Sui Mai which were good. A balanced amount of snappy shrimp and pork took care of the textural aspects of the dumpling while the mild amount of seasoning and shiitake made for a good tasting product. I liked the appearance of the dumpling, especially the ample amount of tobiko on top. The Haw Gow (or Shrimp Dumpling) were equa lly good. 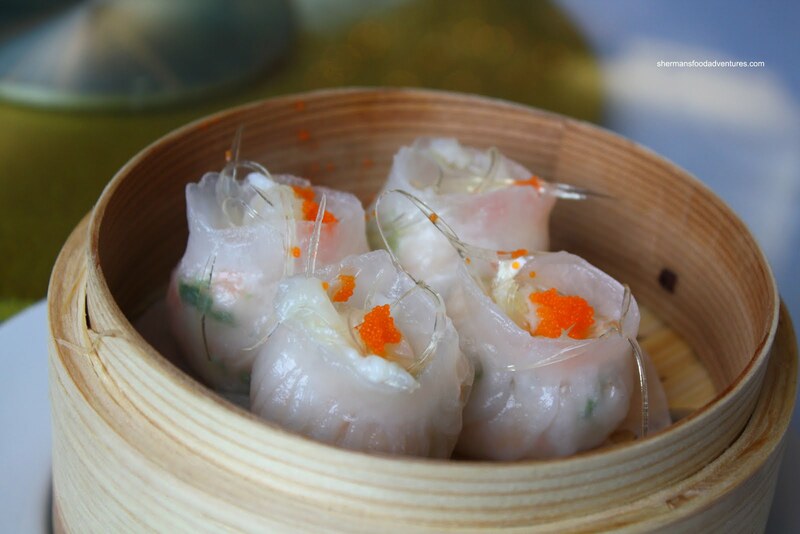 Modest in size; yet high in quality, the shrimp had the requisite snap while the dumpling skin walked the line between being soft or chewy. Not overseasoned either, we could definitely taste the sweetness of the shrimp. I liked the Pork Spareribs. They were tender with a bit of chew left while there was a good flavour from the garlic and peppers. Too bad there was so little of it. When it arrived, it looked as if half of the order was missing. Look, you can see the bottom of the plate! Not a good value at $4.95. Much like the Shrimp Spring Rolls at Bing Sheng, they were plated with the rolls cut diagonally. I kinda like this presentation actually, even though it really isn't functional for dipping purposes. 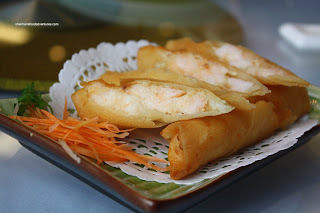 The spring rolls were crunchy and full of garlicky whole shrimp. Solid dish. As for the next one, I wasn't so sure about the concept. 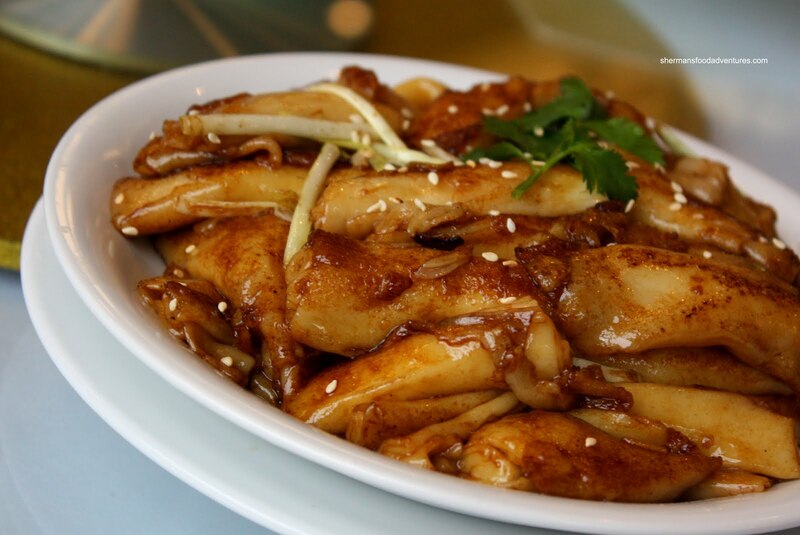 It was Black Chicken with Bamboo Pith and Dried Fish Maw. Hey, the bamboo pith and dried fish maw were good, excellent textural items. The wolfberries on top were both aesthetically pleasing and added a muted sweetness and a touch of bitterness. However, the chicken itself is not something I prefer to eat. You see, black chicken is quite tough and would be best used in soups. Predictably, the chicken here was not very tender, albeit it had a level of sweetness that I liked. I think this would've worked better with regular chicken. Now for some dishes for the kiddies. We got the Baked BBQ Pork Bun for my son, not because he likes it particularly. Rather, this version had a sugary topping which he absolutely loves. So I got the BBQ pork, he got the bun. As for the bun, it was light, soft and of course sweet with the topping. I liked the BBQ pork, it had sweetness with depth and colour without being overly sweet. Consequently, the Steamed BBQ Pork Bun tasted just as good since it had the same filling. I did notice that there was not too much in the way of pork fat in either bun. I do realize pork fat is yummy. I just don't want it predominantly so. The steamed bun was slightly on the chewier side, I would've preferred it to be a more "loose". Not a big issue though. Another fan favourite for the kids is the Pan-Fried Rice Noodle Roll with Soya Sauce. Although the presentation of the dish left a lot to be desired, it was better than it looked. One of the reasons why the noodle rolls looked like they were falling apart was due to the delicate texture. 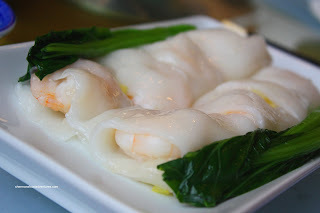 The rice noodle rolls were very soft (in a good way though) with good colour and a nice caramelized soya flavour. Naturally, the Shrimp Rice Noodle Rolls were expected to be just as good and they were. The rice noodle was once again soft while not disintegrating on contact either. Curiously, instead of the typical 3 rolls, there were only 2. Although... there were 4 larg e, perfectly cooked crunchy shrimp inside. Usually, there are only 3. So by doing the math, we are only short by one shrimp despite missing on entire roll. However, it just didn't seem right with only 2 rolls. Normally, Shark's Fin Dumpling is comprised mainly of pork and does not contain real shark's fin. 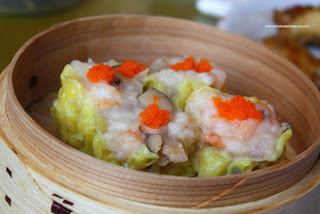 The version here is made up completely of shrimp and chives topped off with tobiko and imitation shark's fin. An interesting take on a classic dumpling. Much like the haw gow, consisting of practically the same ingredients, the textures and flavours were good. Despite employing an ordering system with a checklist, there are times when special dishes roam around the dining room in hopes that someone will try them. My mom loves shrimp/prawns, so it was given that we would take a chance at the one that arrived at our table - Pan-Fried Prawns. Now don't laugh... 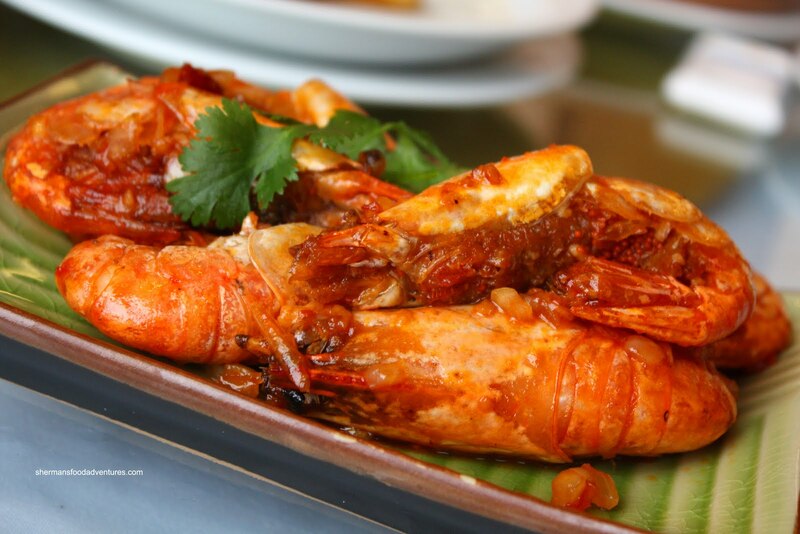 These type of whole prawns with head on are deep fried and then wok-tossed with ketchup. Yes, ketchup. Of course there are other things that go into the sauce; but ketchup is the base. Don't knock it until you try it! I'm serious! The prawns here were cooked perfectly and the sauce was a nice balance of sweetness with a touch of tartness and savoury. 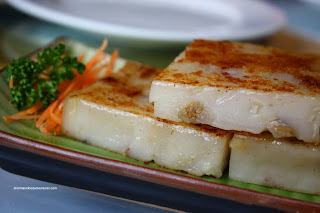 Moving along, the Pan-Fried Daikon Cake was nicely browned. It was mildly seasoned with most of the flavour provided by the dried shrimp and Chinese sausage. It was decently soft, although I would've preferred it to be smoother. Not a big deal breaker though. 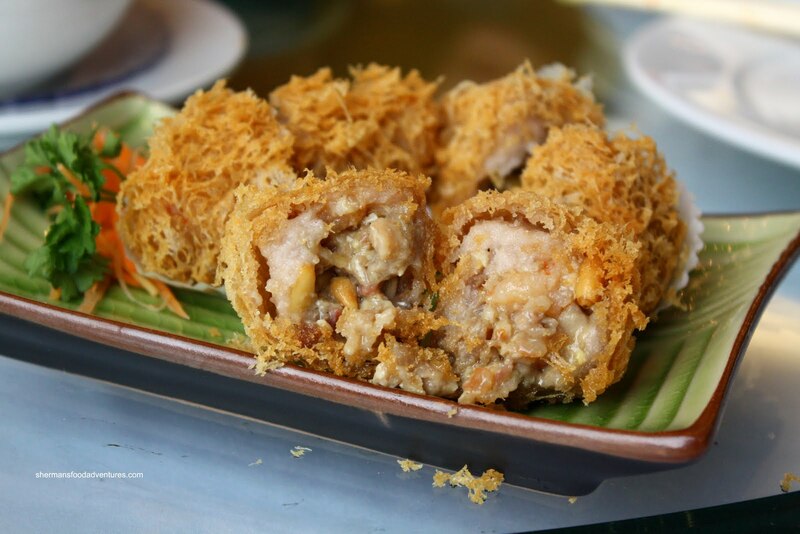 At first, when the Deep Fried Taro Dumplings arrived, they looked pretty good. And in fact, they were very crispy and hot. However, the filling of pork, mushrooms, Chinese sausage and shrimp were diced up into really small bits. Sure, it is supposed to be in small bits; but these were too small. The result was a gritty texture that was none-too-pleasing. I felt that there wasn't enough mashed taro either. Lastly, some parts of the dumpling were quite oily too. Onto dessert, which is my kids favourite part of the meal. Naturally of course... So we started with the Thousand Layer Cake, which is not really all that many layers really. 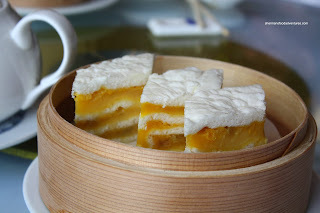 Normally, I really like this dessert because of the salted duck egg yolk. I like the texture and salty-sweetness of it. Yet, it turned out to be more custardy than anything. It wasn't too sweet, which I liked and there were pine nuts. I like pine nuts and it somehow sorta worked here. I saw the coconut and ate the coconut, I just didn't get a lot of coconut flavour. Despite all this, the cake was still decent for what it was. 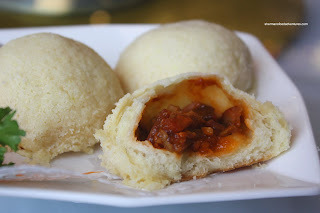 Predictably, my son didn't want any of it; yet curiously ate the Steamed Custard Bun willingly. Why curiously? Consider this. 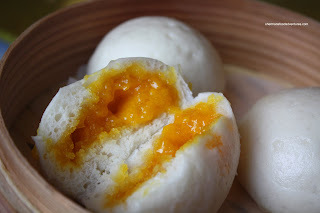 The custard bun here consists of the salted duck egg yolk. Yes, the same stuff that goes into the thousand layer cake. It's all in the head my boy! Anyways, what I didn't get in the cake, I got here in the bun. The salted duck egg yolk filling had it all. It was a bit greasy, a bit salty and a bit sweet. You gotta eat it to understand what I'm saying. It was good, lots of filling too. The bun was slightly chewy much like the BBQ pork bun. Not a big deal again. 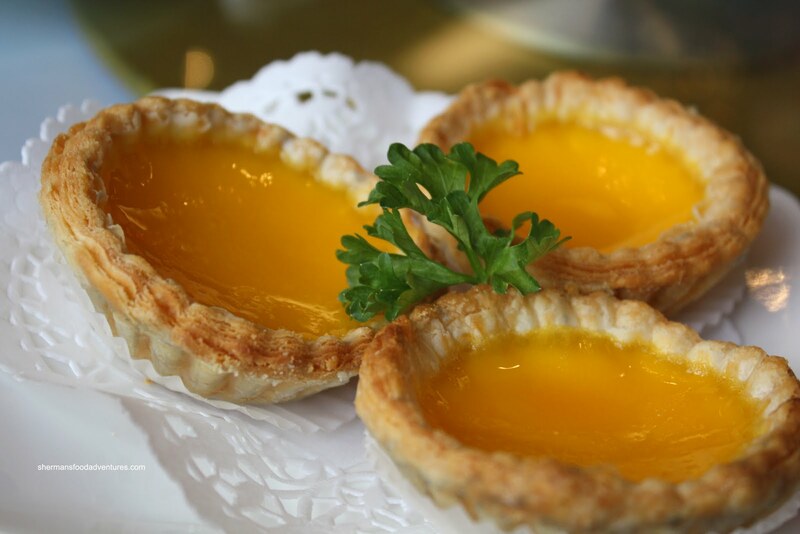 Our last dessert was the Egg Tarts. For me, I am completely biased towards the flaky pastry-type. I absolutely despise the tart shell version. I find that it completely ruins the texture of the soft egg filling. So for me at least, I was happy with the egg tarts here. The flaky pastry was a tad sweet though. I found that it interfered with the egg custard itself. Not a big deal I suppose because the egg tart as a whole was quite good. 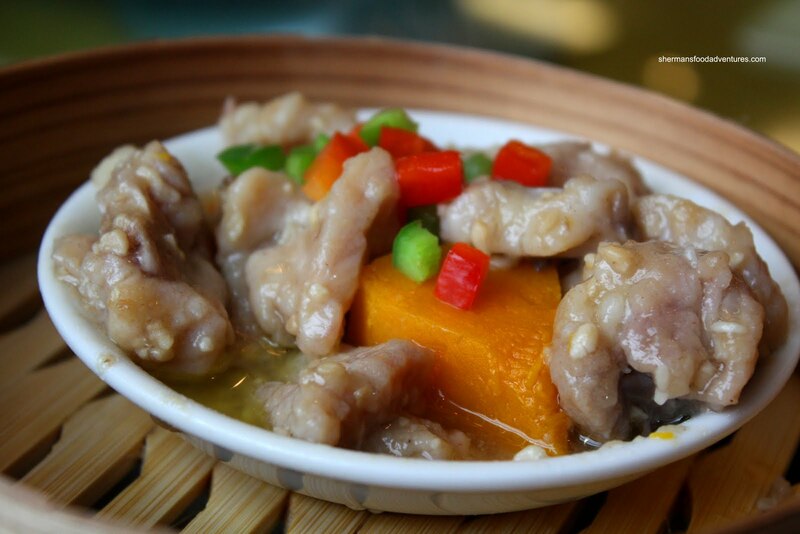 In fact, I thought most of the food was solid due to the use of good ingredients and careful preparation. It better be though. The prices are extremely high for Burnaby. Normally, we wouldn't find these prices other than Downtown at places such as Imperial, Victoria and Kirin. I guess the prices reflect the level of service, decor and restaurant class as much as its location in the Delta Hotel. If you were looking for value, it would be best to move along. But if you want to pay handsomely for all the aforementioned characteristics, then Grand Dynasty is your place. Awesome! That's walking distance from our house! I'd happily tradeoff higher prices for not having to drive! After coming back from Dol Ho, pretty much everything is expensive, hahahaha! But, seriously, it is possible that, due to its location, it might not be necessarily aimed at us (despite it being, as you mentioned, advertised in Chinese media). So, from that perspective, you can take it more on lines of it being a destination (similar to Ebo in the hotel as well) or catered to the people who are already at the hotel/casino (at which point, price range might not be the main issue). What matters is that, if you are not willing to face that zoo at Fortune House or the purgatory at Po King and have $$$ to burn, well, it is an option regardless! Oh, forgot key question: push cart or order sheet? Kim, yup the clientele from the casino and hotel are probably going to eat there regardless of price. Furthermore, there are many people who will gladly pay, such as my parents. They liked the place. For me, I liked it too and I don't mind paying lots of $$$ for good food either. However, the portion sizes need to improve a bit though. 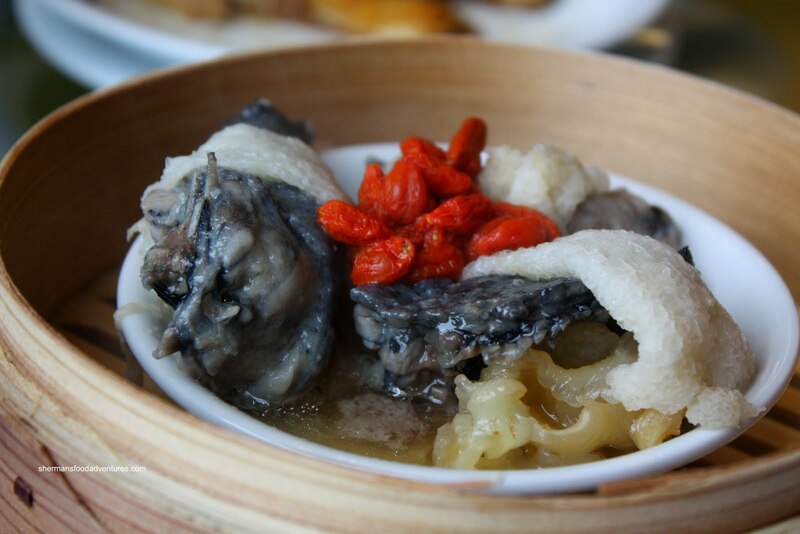 For the same price, the other high-end Dim Sum restaurants offer up more food. 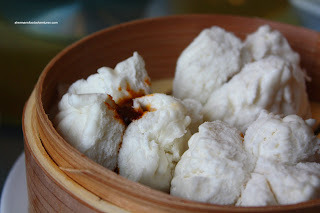 What places do you recommend for Dimsum in Richmond? I love ordering off the cart, but don't like really aggressive places that have you take over your own table through hostile methods (like sending you over to watch them eat to pressure them to leave). Kim, I forgot to mention, it is by order sheet only. Ivy, in Richmond, I'd do Sea Harbour. That's really good. Hi Sherman, off-hand, do you recall what Sea Harbour's prices are (S/M/L) ? I may be taking some guests to dim sum in Richmond in the next couple of weeks. Without any pointers I'm totally lost in Richmond as to what are good-valued and worthy restos, especially for dim sum since there's so much of them. BTW, I heard HKYK (hot pot) is pretty good for dim sum too. Is that true ? Hi LR, I believe S: $3.75, M: $4.50, L: $4.95 at Sea Harbour. 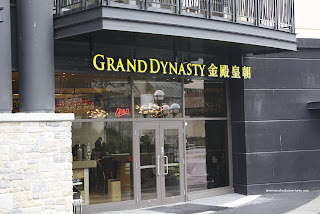 So only slightly less than Grand Dynasty. But I think it's worth it. In terms of good value, South Ocean is inexpensive and decent. HKYK, I've heard the same things, but I've never been, so YMMV. Hope this helps. Chubbychick, agreed on Fortune House. Not that appealing during peak hours for sure. Grand Dynasty definitely has potential. Any excuse not to go into Richmond is a good one. Hey Sherman, I went here because I found Grand Dynasty won some Burnaby award, then I checked this to make sure that you think it's good. Looked like a pretty good review so I gave it a try today. I do not like to eat foods with MSG since it's an unhealthy food additive and I've had some reactions to it in the past. So I wrote on their FB page asking whether they have MSG in their food. I received a really nice response saying that they make their food to order so just tell them not to add it in and it won't be a problem. I went today and did just that. Walter, our waiter said that the food is pre-made and everything has MSG except the bigger dishes. He went on to say in a condescending manner, that the whole world uses MSG in dim sum (not true of some of the newer and higher end restaurants) and had the balls to continue on in this manner and asked me whether I've ever eaten dim sum before because if I have, then I would know that there is always MSG in dim sum. I dated a guy who worked at a Chinese restaurant before so I knew to keep my mouth shut until the food was all served. After all, I wouldn't want to have a side of spit with my MSG. Now onto the food. The food was ok. Nothing spectacular. Most of the items with the exception of the bigger dishes were loaded with MSG. The only thing that tasted great, was the egg tart. One of the best I've had. When we got our bill, it appears that Walter doesn't even know how to count. He charged us for tea for 6 people when there were only 5 adults and 2 babies. Oh, and for a restaurant of this caliber, you would expect that they wouldn't use cracked bowls. Not so - see picture. Needless to say Grand Dynasty can thank their mouthy waiter. We won't be going back there ever again and neither will our friends and family. Maybe I'll send my husband to get egg tart take-out. @Eva Actually, I totally agree. Last time during the CRA media tour, I got to try their specialties and they were not very good. Going downhill?